Zoho is advancing its ambitions to become an "operating system for business" with the addition of artificial intelligence (AI) and sales process automation to its enterprise software suite. The company today is announcing the addition of AI to Zoho CRM and introducing Blueprint, a sales process automation platform. Building a digital workplace poses challenges to any business. But those in regulated industries, such as law firms, have specific needs which add an extra layer of complexity. Sorry, I could not help myself with the "alternative fact" reference in the title. Just seemed appropriate given the context for as hard as it may be to believe for some, when a brand improves its customer experience, its revenue can and will increase, oftentimes significantly. That was the overall finding of a recently-released Forrester report entitled "Drive Revenue With Great Customer Experience, 2017" which reveals the connection between customer experience quality and revenue growth across 13 different industries. The problem, or challenge as spelled out in the report is "many customer experience (CX) pros find it hard to show the connection between improving CX and growing revenue." The high per unit revenue from the sale of a vehicle gives mass market auto manufacturers the highest revenue potential: A one point improvement in a mass market auto manufacturer’s CX Index score could result in $873 million in increased revenue. Traditional retail banks and direct banks are the two industries where the revenue upside from improving customer experience gets progressively bigger with higher CX Index scores: For traditional retail banks, increasing an already excellent CX Index score by one point drives revenue potential four times as much as increasing a poor CX Index score by one point. While the credit card industry has the lowest revenue potential related to CX Index scores, its advocacy revenue potential is 10 times greater than other industries, accounting for 31% of credit cards’ total CX-driven revenue potential. One of the paper's authors Maxie Schmidt, says there are two key reasons why so many brands have had problems showing the connection between improving CX and growing revenue. Data challenges: Brands don't have the data they need to do that, at the level of granularity they need. Good CX leads to revenue because customers don't churn, buy more or get other customers to buy. But most companies cannot measure those behaviors at the individual customer level. And even if they could, they'd still not know the quality of each customer's customer experience. And data isn't available in a format that allows firms to correlate both. As for mistakes she sees brands making when it comes to CX she says one is trying to force the customer into a process instead of building a process around the customer needs. "This happens often also because companies are overly focused on optimizing their internal processes while they don't understand the customer perspective and the customer's journey," she says. As customer expectations continue to rise, businesses need to appoint a senior executive like the Chief Marketing Officer to deliver exceptional, end-to-end customer experiences. It’s a tall order, but if done right, enhanced customer experiences translate into not only increased revenue but loyalty and repeat business. Download Should the Chief Marketing Officer Oversee the Whole Customer Experience? — written by Natalie L. Petouhoff, Vice President and Principal Analyst for Constellation Research and see for yourself how marketing leaders can create a basic blueprint to embark on a discussion about customer experience and how best to lead this key strategic initiative in their organization. This post is based on a previously published post in Forbes. Delivering a truly transformational digital workplace comes down to this: the successful creation and execution of an integrated vision for people, place and technology. Developing different elements of your workplace independently is a waste of time if you fail to bring them together to create the best possible employee experience. You had trouble sleeping again last night. Up until the time you got into bed, you were looking at their Twitter feed, their Facebook page, and their website. You’re completely preoccupied with everything they do … and for a seemingly good reason. Their customer base seems to keep growing and they keep expanding their offerings, while you’re just trying to keep your head above water. While it’s natural for that question to arise in your mind, it may stifle your progress if you’re thinking in terms of duplicating their marketing efforts. Prospects don’t want to see a carbon copy of another business and you don’t want to obsess about competitors anymore, so I’m going to show you how you can immediately become energized about and sharply focused on your own marketing ideas instead. Brian’s recent post about how to build trust and Sonia’s post about how to stop being boring are two sides of the same content marketing strategy coin. The benefits of creating not boring content are essentially everything you wish to achieve with content marketing. It allows you to build an audience of interested prospects who trust you to solve their problems. They trust you because they know your personality. They know your sense of humor. They know your favorite analogies. Your word-choice preferences. What irritates you. What warms your heart. They want to hear from you. You’re their go-to resource. So, if a prospect chooses a competitor over your business, it’s likely because your competitor has revealed themselves to their audience in ways that you haven’t … yet. What’s editing got to do with it? The example we’re going to look at today comes from the service business world — specifically an editor who offers his services to clients — but you’ll be able to see how these ideas can be applied to any niche or product. There can be a difference between what you think your prospect needs to hear and what your prospect actually needs to hear. He pays fierce attention to detail. He is a “grammar nerd,” with extensive training and experience. He loves working with writers. Your draft will be flawless when it’s returned to you. It will be returned to you on time. You’ll get feedback about common mistakes you make. Every writer thinks their final draft is perfect. Most only have someone else edit and proofread their work for good measure. If a writer is your prospect, you have to do something else to win her business. Those bullet points above don’t impress the prospect, and even if they did, the majority of other editors offering their services on the web make the exact same claims. When selecting an editor, the prospect is actually concerned about the intimate act of another person — a stranger — reviewing and revising her writing. 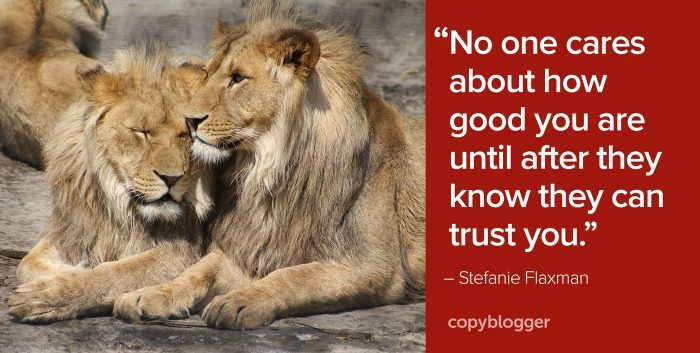 How do you get someone to trust you? Even though you may superficially provide the same product or service as your competitor, you choose to attract the exact right prospects for your business. When you decide to not be boring, you step into your power as a creative content marketer — an artist who reveals himself to his audience and builds trust. Like your favorite painter or musician. Information does not equal content. If someone could find what you create on Wikipedia or your competitor’s blog, your content will not be the type that builds trust over time. The type that builds trust produces a valuable, entertaining experience for your audience member and has a clear, unique payoff. Your content is an opportunity for you to take knowledge you’ve acquired and supercharge it with your perspective. Then you’ll share your creations to reach the people who are attracted to your communication style. Now, you do have to provide an outstanding product or service once a prospect accepts your offer. All that trust you’ve built won’t help if you don’t fulfill your promise. But think about the powerhouse force that is in motion when you’ve built enough trust to make a sale — and then meet (or even exceed) your customer’s expectations? You’ve become the only reasonable choice for that person and made the competition irrelevant. And when you nurture your existing customer base, you’ll get testimonials to display on your website that further demonstrate your trustworthiness. Those happy customers will also recommend you by word of mouth if someone they know needs a product or service like yours. It all starts with smart content. If your competitor’s business seems less interesting now … good. You’ll have a lot more free time to get to work. Image source: Gwen Weustink via Unsplash. The post Why a Prospect You Want Chooses Your Competitor appeared first on Copyblogger. Boston-based harmon.ie is taking steps to unify disconnected information from multiple cloud services, all within the Outlook inbox. The company, which provides a suite of products to support the digital workplace, is sharpening its focus by pulling its existing Collage tool into Outlook, harmon.